La vieja torre, rodeada de un halo mágico que nadie sabía quién había tejido, estaba poblada por toda una legión de karakasa entre multitud de otros tzukogami (objetos inanimados que toman consciencia al cumplir los 100 años de edad). Por lo general, no se trata de seres hostiles o malvados, pero, la forma de Mya de irrumpir en la torre los hizo montar en ira y volverse muy peligrosos. La pobre Mya se refugió en lo más alto de la torre, incapaz de atreverse a bajar los 25 pisos para volver a casa, sobreviviendo a duras penas durante semanas enteras. The old tower, surrounded by a magic halo knitted by God only knows who, was populated by a whole army of karakasas among a multitude of other kinds of tzukogamis (inanimated objects which become conscious after they are more than 100 years old). Commonly, they are not hostile at all but, the way Mya broke into the tower made them get very angry and become really dangerous. Poor Mya refugeed in a chamber located at the top of the tower, unable to descend the 25 floors and return home, surviving miserably during several weeks. En este juego encarnas una vez más a Nanako. El juego consta de 25 niveles, cada uno representando una planta de la torre Heún. Para alcanzar el siguiente nivel deberás literalmente construirte un camino para salir por la parte superior de la pantalla. Esto se logra gracias a la habilidad de Nanako de poder acarrear cajas de madera y dejarlas en otro lugar, sólo una cada vez. Al principio de cada nivel se da una contraseña (usando el alfabeto Kun) que podemos emplear para acceder directamente al mismo en lugar de tener que empezar de cero en cada partida. Usa arriba, abajo, izquierda y derecha para escribir la contraseña. Pulsa saltar para validarla. In this game you control Nanako. 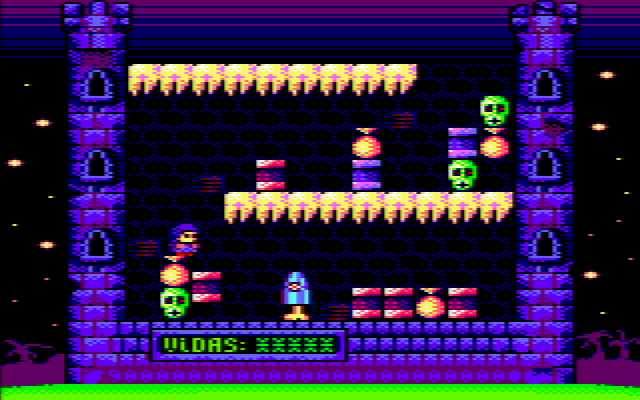 The game consists on 25 levels, each one representing one of the floors in the tower. In each one, to reach the following level you have to literally build up your path to the top of the screen. This can be managed with Nanako’s ability to carry boxes (only one at a time) and drop them elsewhere. At the beginning of each levels a password is given (using the Kun alphabet) which we can use to access directly to that level instead of having to start over once and again. Use LEFT/RIGHT/UP/DOWN to write the password and JUMP to validate it. Si te quedas atrapado o no sabes cómo seguir, pulsa R para reiniciar el nivel (perderás una vida). Pulsa ESC/BREAK para volver al menú. You can redefine the keyboard controls. By default, you walk left/right using the left/right cursor keys, you get a box hitting cursor down and drop it hitting cursor up. To jump, use the space bar. Press R to retry the level (you will lose a life), and ESC/BREAK to go back to the main menu. 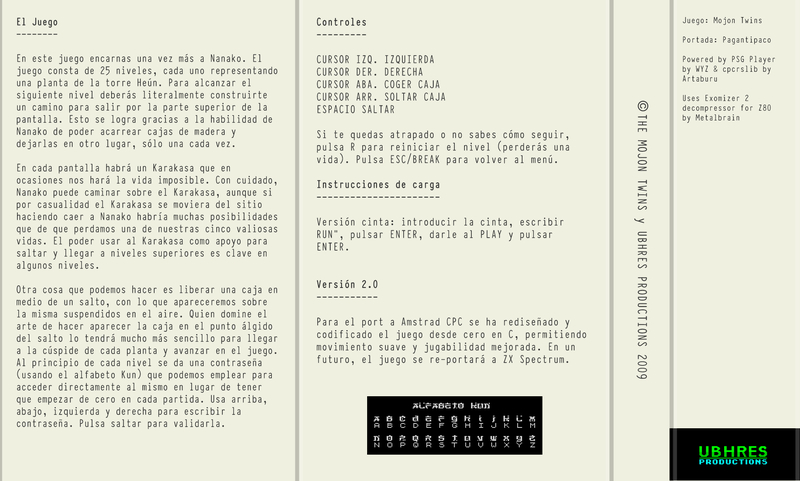 Para el port a Amstrad CPC se ha rediseñado y codificado el juego desde cero en C, permitiendo movimiento suave y jugabilidad mejorada. 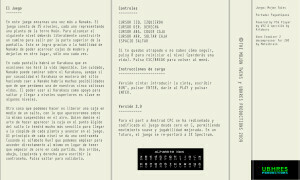 En un futuro, el juego se re-portará a ZX Spectrum. 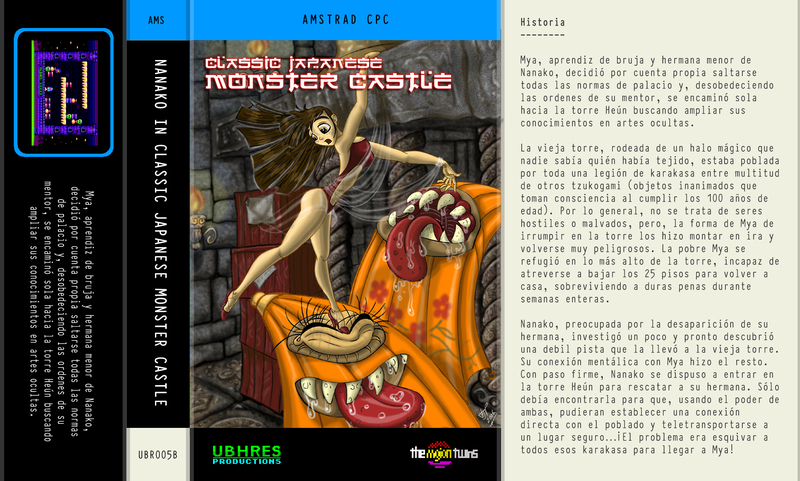 Pingback: Mojon Twins Dome » ¡Nanako in Classic Japanese Monster Castle para CPC ya en la calle!